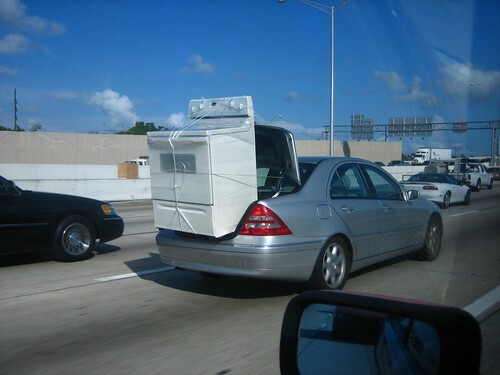 This looks like the Beverly Hill Billies Version 2.0. And there are some people who question if “Miami Drivers Are the Worst”. Great pic, Alesh. I just told Fark and BoingBoing about it. Hey, I gotta git my chit home to Hialeah somehow, jew know. And this being Miami, the guy behind him was still tailgating. You guys are heartless. Heartless! Here’s a Meals To Go volunteer selflessly working for our community’s needy population, and all you do is pile on. Actually, that was Manola’s hurricane season boyfriend delivering the stove to make the paella.